The Manchester City boss believes only the England forward’s finishing is preventing him being seen among the game’s elite. Raheem Sterling will be one of the best players in the world if he can become a better finisher, Manchester City boss Pep Guardiola believes. 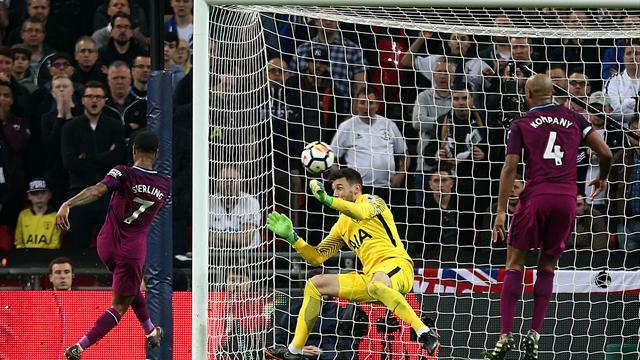 Sterling put in an impressive display as City breezed past Tottenham 3-1 at Wembley on Saturday in what turned out to be a Premier League title-clinching win following Manchester United’s surprise defeat to West Brom on Sunday. The England international scored one against Spurs and won a penalty in a man-of-the-match display, but missed two glaring chances and his prowess in front of goal has long been his weakness. He was particularly wasteful against United last weekend when missing two one-on-ones, which proved costly as City squandered a 2-0 lead to lose 3-2. Guardiola believes the 23-year-old’s talent is among the best in the world but has told him to work harder at converting chances, even though he has bagged 22 times this season. “The moment he can (improve) his average chances to score a goal, he will become one of the best players in the world,” Guardiola said after the Saturday evening kick-off. “He missed two clear, clear chances against United. He missed today. “The moment he will improve that, he will be a top, top player because he’s so fast, a dynamic player, has character one against one. He is an excellent guy. “He unlocks everything but when you think about it he did much, much better than last season and that was important. The problem will be next season to compete with what he has done. City were surprisingly crowned champions after Jose Mourinho’s side were embarrassed in a 1-0 home defeat to rock-bottom West Brom on Sunday. It went some way to atoning for a disappointing 10 days and they passed a tough test at Wembley after a horror week which saw them lose to United and crash out of the Champions League to Liverpool. But they were back to their irresistible best against Spurs as Gabriel Jesus and Ilkay Gundogan put them 2-0 up early on, with Sterling sealing the win after Christian Eriksen had given the hosts hope. The defeat for Spurs was their first in 14 Premier League games going back to the reverse fixture with City in December. They still have a seven-point buffer over Chelsea in the race for the Champions League and boss Mauricio Pochettino is content. “I’m so happy with our season and we need to realise that we need to keep pushing and to keep working because to play at this level is about being consistent and showing better quality,” he said. “We conceded from a long ball, a penalty that wasn’t and a set-piece – goals we can’t concede.